Welcome to our guide to the Yorkie Poo. 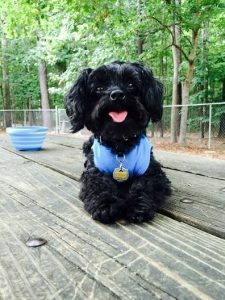 The DogExperts.info website aims to ask questions to breeders, vets and experienced owners to get the answers to your most frequently asked questions about the Yorkie Poo breed of dog. We would love to feature your dog and publish any photos or pictures of your Yorkie Poo you would like to email us. Are you looking to buy a Yorkie Poo – then see our list of Yorkie Poo breeders. 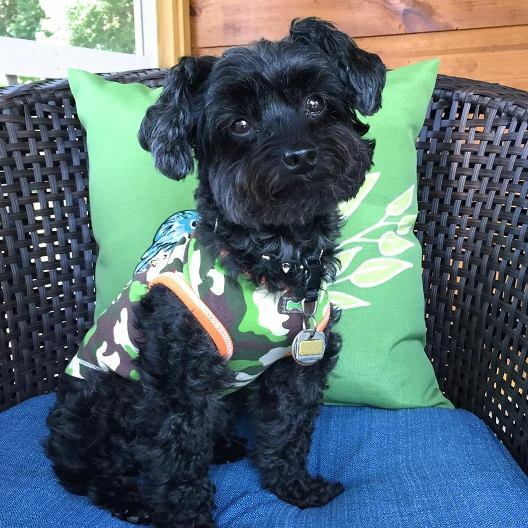 On this page, we feature an interview with the owner of Homie Danger, a male Yorkie Poo. Our names are Lisa Hathorne-Williams and Homie Danger Williams. We live in Raleigh, North Carolina. How long have you owned a Yorkie Poo? Most importantly, you don’t own them they own you! Homie Danger has been with me since April 25, 2011. Homie Danger is a rescue off the street in our neighborhood. He first came to my attention in September 2010 when he was caught in a raccoon trap that a neighbor had set. They immediately released him when they realized what they had caught. He was wearing a Christmas sweater that was unraveling and he was trailing trash behind that was caught up in the wool. He ran away and continued to wander our subdivision. I still had our two retired Greyhounds that I walked every day. I kept my eye out for this little black dog and never saw him although I was constantly being told from neighbors that he was out there. A friend came to lunch on April 25, 2011 and told me he had noticed the “little black dog” and that it appeared that his leg was broken. I went searching for him that afternoon and found him hiding up under a tree. After 3 hours of coaxing him I finally had to make a flying tackle as he was not going to willingly come to me. He was so badly matted that his entire right rear leg was unusable. Fortunately, nothing broken but he was only able to walk on three legs. That was a Monday afternoon. The first available Vet appointment was that Wednesday morning. He was 5.3, not chipped, was an intact male and still had three puppy teeth. I had an entire medical update done, had him neutered two weeks later and he became my boy. After 8 or more months of wandering our neighborhood he now had a home. He has been DNA tested and the results came back Yorkshire Terrier and Miniature Poodle three generations back on both sides of his family. First, I have to mention that he is the first “toy” that I have ever owned. The smallest dog I’ve ever had was a Beagle mix. The Beagle was followed by four Dobermans and then two Greyhounds over a period of 30 plus years. Homie Danger was a huge change for me. I had to read up on the “Small Dog Syndrome” to understand what behavior was actually acceptable. We have a tendency to allow our smaller breeds to get away with behavior that would never be tolerated in a larger breed. He was enrolled in a Canine Good Citizen Class and although he did not pass he did learn quite a lot over the 8-week class. What makes this breed so special is simply the fact that he combines the best of both breeds. He has the intelligence of a Poodle and the tenacity of a Terrier. He has no idea of his actual size but, I am sure, sees himself as a Rottweiler or German Shepherd. He is not afraid of anything, very inquisitive and so playful. My Vet told me he should have a very long life span and relatively few health issues as he is a mixed breed. I can only speak for Homie Danger but he can be a clown when he wants to be but also a protector when necessary. I find that his ability to ride comfortably for long trips in the car is a huge plus. He goes everywhere with me on a daily basis and does not mind riding in a carry bag across my shoulder. He has stayed in hotels from Maine to Florida. Due to the time he spent on his own, at such a young age, he is not very trusting of men wearing ball caps and sunglasses. He hates the UPS truck, and does not like children at all. The more excitable the kids are the worse the situation becomes. He may have belonged to a family with children where he was mistreated or mishandled. With this said, I’ve met other Yorkie-Poo’s that are great with kids. I don’t think it is fair to judge the breed overall by Homie Danger’s behavior due to not knowing anything about his early months. I do suggest that any family with young children should always read up on the breed before bringing home just any dog, as they don’t all do well with kids. I believe the Yorkie Poo is quite a popular dog on social media/Internet these days, can you tell us how this started? There’s no doubt that the smaller the dog the more adorable people find them. The fact that Homie Danger will always be “puppy-size” is something that people find irresistible. That’s typically the first question that people ask, “is he a puppy?” I think that’s why larger breeds lose their appeal and eventually end up in shelters. As puppies they are precious and for some people, once they’re grown, people don’t want them anymore. I find this to be tragic but true. So, overall, the fact that the Yorkie Poo’s stay small, and are often seen wearing clothing, people can’t get enough. What are your feeding routines, such as how often and what types of food do you feed the Yorkie Poo? Homie Danger has experienced some small seizures. I’ve done all the tests possible and my Vet has said we may never know what is causing them. I mention this as I have found information pertaining to Rosemary Extract as being a possible culprit. You would be surprised at just how many dog foods contain Rosemary Extract. The claim is that this can trigger seizures in dog that may be prone to seizure activity. As long as I watch the contents we do just fine. Homie Danger is a very picky eater but I have finally found Weruva in the small packets. I often mix chicken or beef that I have cooked along with green beans to any one of the flavors except the fish and he seems to be happy. He eats in the morning at breakfast time and also at dinnertime. As I mentioned, in answering the previous question, he has shown some seizure activity. I have kept this under control by watching the contents of all dog foods. Because he is a small breed, attention needs to be on teeth cleaning. I, luckily, have a Vet that has perfected a method of cleaning his teeth without having to put him under. I also give him Nzymes for his coat and joints. Obviously, grooming is another major aspect of owning a Yorkie Poo. Can you offer any tips, advice and popular accessories for your Yorkie Poo? Homie Danger is groomed once a month as it is important to have his ears plucked and the nails kept short. I also bathe him at home as he does not mind me using the blow dryer on him. Why Choose a Yorkie Poo? What type of owners buy a Yorkie Poo? What in your opinion are the best things about the Yorkie Poo breed? Why do you think the Yorkie Poo is special? What are your favourite things about the Yorkie Poo? Are you glad you choose to buy a Yorkie Poo and not another breed? How would you describe the Yorkie Poo temperament? What advice might you give to people thinking about whether they should buy a Yorkie Poo over other breeds? What are the history and origins of the Yorkie Poo? What colors of Yorkie Poo are most popular? What does the Yorkie Poo look like? What are the pros/cons of the Yorkie Poo breed? What can a new owner expect in terms of differences between the Yorkie Poo and other breeds? What type of typical personality does the Yorkie Poo have? Is it possible to describe a fairly typical Yorkie Poo? What is the breed standard/description for the Yorkie Poo? Are there any downsides to owning a Yorkie Poo that prospective owners should be aware of? Is the Yorkie Poo breed of dog suitable for first-time dog owners? Some breeds can be described as greedy and prone to weight issues, would this apply to the Yorkie Poo? Is the Yorkie Poo a breed suitable for a person or family that are out at work all day? Some owners seek a breed suitable for barking and offering a guard dog role – how does the Yorkie Poo match up to that role? Are there myths about the Yorkie Poo – in other words do new potential owners come to you with misconceptions about this breed? What types of questions do you get once owners get their Yorkie Poo home? What is the typical temperament of a Yorkie Poo, so people know what to expect from their new pet? When fully grown how much on average does a Yorkie Poo weigh? When the Yorkie Poo is full grown in size what is the maximum height and length expected to be? Is the Yorkie Poo ever crossed or mixed with other breeds of dog? Does the Yorkie Poo smell or drool a lot? Do you have a Yorkie Poo growth chart? What breed group does the Yorkie Poo come under? Are there some types of people that you can suggest the Yorkie Poo is not suitable for, perhaps families? How is the Yorkie Poo with children? Do you think the Yorkie Poo is suitable for families with young children? How does the Yorkie Poo get along with other (existing) pets and do you have any tips or advice for new Yorkie Poo owners in terms of successful integration? Is it better to buy one Yorkie Poo or two? Would the Yorkie Poo be suitable as a guard dog? Can I leave my Yorkie Poo during the day while I go to work? What is the expected average lifespan of the Yorkie Poo? In terms of life expectancy, how long on average would the Yorkie Poo breed live to? How to handle the Yorkie Poo puppy to start off – how much food, what type, how often? Do owners need to consider supplements for their Yorkie Poo? How much did your Yorkie Poo cost to buy? Can you offer advice to people looking to buy a Yorkie Poo and how much should they spend? 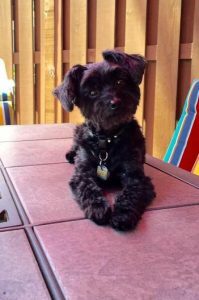 What advice would you offer new Yorkie Poo owners? What types of people are buying the Yorkie Poo and why? Where can I buy Yorkie Poo rescue dogs or find a Yorkie Poo for adoption? Please note that buying or searching for a ‘cheap’ Yorkie Poo can be false economy as they may have health issues that cost you far more in the long-term – always buy from a good and responsible breeder! How much do Yorkie Poo puppies for sale cost on average? How would you describe the Yorkie Poo puppy to potential new owners? What types of owners are best suited to owning a Yorkie Poo? What inspired you to become a breeder and did you start with the Yorkie Poo? As a Yorkie Poo breed expert, are there any ‘essential’ tips you would like to share with new owners? How long does it take to housetrain/potty train a Yorkie Poo? We invite you to email us your Yorkie Poo’s pictures, in particular we are looking for photos showing Yorkie Poo puppies at 1, 2, 3, 4, 5, 6, 7, 8, 9, 10, 11 and 12 weeks old as well as early pictures such as 1, 2, 3, 4, 5, 6, 7, 8, 9, 10 and 11 months old to a year old. Do they have any nicknames or does the Yorkie Poo have popular names? If my Yorkie Poo is pregnant what might the litter size be? Could the Yorkie Poo be dangerous around young children? How do you prevent a Yorkie Poo biting? How do you prevent a Yorkie Poo chewing? How do you stop a Yorkie Poo jumping up? Does the Yorkie Poo have an issue with excessive digging? Why does my Yorkie Poo keep growling and barking? Is there a reason my Yorkie Poo dog is often scratching excessively? In comparison perhaps to other breeds what can you say about the Yorkie Poo and their exercise needs and do you have any tips or advice for new Yorkie Poo owners? As a breeder of the Yorkie Poo , do you prefer a collar or harness? As an expert of the Yorkie Poo breed do you prefer a standard leash or retractable? Can you offer any dog walking tips for Yorkie Poo owners? What games and toys can you recommend for the Yorkie Poo? How intelligent is the Yorkie Poo compared to other dog breeds? Do you have any special grooming routines or tips and advice for new Yorkie Poo owners? What accessories are required to be purchased for grooming a Yorkie Poo? How much do Yorkie Poo shed and how do I maintain their hair and how often? Is the Yorkie Poo a hypoallergenic breed? Any advice/tips you can give concerning cleaning and bathing your Yorkie Poo? 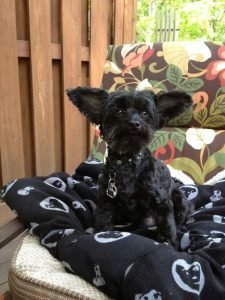 Can you offer new Yorkie Poo owners advice concerning fleas and maybe products you use in treatment and prevention? What advice and tips could you offer to owners who might wish to follow your path in showing the Yorkie Poo? What started your interest in showing the Yorkie Poo? If a new owner perhaps wanted to meet other owners or find out more – perhaps they have an interest in joining a local club or maybe they wonder how they can start showing their Yorkie Poo – where would they begin? How would an owner know they have a show-quality Yorkie Poo and how would they start off? What inspired you to become a breeder and did you start with Yorkie Poos? What official organisations are there for the new Yorkie Poo owner and what benefits or services do they provide? In buying a Yorkie Poo, can you offer advice and tips to new owners? How did you progress to becoming a breeder and why focus on breeding the Yorkie Poo out of all the breeds you could have chosen? What do you think makes the Yorkie Poo special to you? In comparison perhaps to other breeds what is it like to train a Yorkie Poo and do you have any tips or advice for new Yorkie Poo owners? How should new owners approach bringing a new Yorkie Poo home, any advice and tips you can give? Should I allow my Yorkie Poo to sleep in my bed or elsewhere in the house? Should my Yorkie Poo sleep in a kennel or crate? Health is always a major concern when buying a dog, do you have any advice for new Yorkie Poo owners to be aware of in particular? What is the recommended schedule for vaccinations for your Yorkie Poo? What type of health issues can a Yorkie Poo have and how do you deal with preventing these? Why does my Yorkie Poo have diarrhea? Why is my Yorkie Poo vomiting and do I go to the vets? When should I take my Yorkie Poo for vaccinations and which ones do they need and how often? How often will my Yorkie Poo be in heat? Should I consider getting my Yorkie Poo spayed or neutered and when and how much does this cost and what are the benefits? My Yorkie Poo is limping, what should I do and should I go to a veterinarian surgeon? Why is my Yorkie Poo not eating? How much does it cost to insure my Yorkie Poo? What healthcare issues or diseases might be excluded from companies that provide Yorkie Poo dog health insurance? What age would you class as an ‘older or senior’ Yorkie Poo? What changes in food and diet would you suggest making for an older Yorkie Poo? Do you feed any supplements to an older Yorkie Poo – or anything else which helps them as they age? Are there any health issues particular to a senior Yorkie Poo dog? Do you have any advice for owners of an older/senior Yorkie Poo or tips you can pass on? Check out the video below and watch how three Yorkie Poo puppies explore their surroundings.